Virtual Campus is a part of VirtualOulu, a detailed 3D city model of Oulu, Finland implemented as an open innovation platform for developing new 3D applications. Virtual Campus was originally build as a platform for applications that can be expanded to the Virtual City, but the unique characteristics of the very wide indoor space makes it a noteworthy target for specific applications in education, emergency simulation/training, orientation and research. Virtual Campus contains detailed indoor models from key areas around the main corridor of the campus and many adjoined spaces such as the main lecture halls. The current virtual campus is constantly expanded with new areas. The ultimate goal is to cover the full campus someday, making it possible to create applications for maintenance and green-use for the whole building complex. The campus has been and is manually modeled by the following companies: CubiCasa, VALO Company and the University of Oulu. The work is coordinated by the Center for Ubiquitous Computing (UBICOMP) at the University of Oulu. VirtualCampus is available as runtime exports (FBX files) and source materials (Blender). In practice, runtime exports can be used in any way including commercial products as long as appropriate credit is given. Any modifications to the original source files have to be shared. The motivation is to allow open utilization of the models while ensuring that improvements to the models are shared so that the good and up-to-date version of VirtualOulu would be publicly available. The repositories are “live” one, meaning that content updates are frequent. You can import these models into game engines such as Unity or Unreal. Download 3D models for VirtualCampus. Download VirtualCampus as a Unity package. Tellus Arena has been recently renovated and it contains Helvar’s sophisticated lighting solutions. In addition, the space is being equipped with the most recent sensor technology. Virtual Campus models will be used to visualize the available sensor data. The models are also currently being used in a study on visualization lighting change in meeting rooms. The pilot areas of Virtual Campus were utilized in creating a FVS using Finpeda’s solution for collaborative spaces for educational purpose. The goal was to explore the possibility of using an existing solutions that has a strong pedagogic foundation to create a joined virtual space for campus dwellers. We noticed that the solution is ideal for small class rooms, but it is unscalable to the whole campus, where social closeness and space functionality vary considerably. The Campus FVS are still live and one can explore them via Chrome browser. 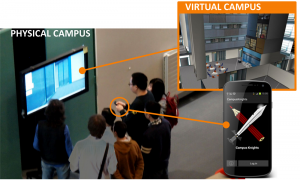 Campus Knights was one of the very first application that utilized the Virtual Campus models. The purpose was to study the applicability of pervasive displays as an access point to the virtual space, with the underlying thought that the study would be expanded later downtown as happened with City Knights game. Hybrid Avatar is a conseptual outliner for a system for telepresence using multiple virtual and augmented reality platforms (AVATAREX). The initial studies with the system were conducted using Virtual Campus models from Ubicomp premices. Since the campus is the second home to many students and the models have been available for awhile in such courses as Applied Computing Project and 3D Virtual Environments and Applications, we have accumulated many small games and student work. Although many of these projects are tongue-to-cheek, their production has been a valuable tool in evaluating and improving the accessibility of the Virtual Campus materials. Koskela T, Pouke M, Alavesa P, Kukka H, Pakanen M, Alatalo T, & Ojala T (2016). “Hybrid avatars: enabling co-presence in multiple realities.” In Proceedings of the 21st International Conference on Web3D Technology, Anaheim , CA, USA, 69–72. All content related to VirtualCampus are provided as is without any guarantees for correctness and quality.